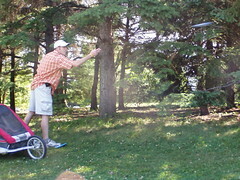 For those not in the know about the sport, disc golf is much like 'ball golf'. The game is similar in the respect that they both involve moving an object from a tee area into a target. In the case of disc golf you throw a disc/frisbee from the tee towards a 'pole-hole'. A pole-hole is a basket on a stand, with a set of chains that hang down into the basket from a ring above. The disc must land in the basket, and the chains are there to slow down a fast-moving disc and allow it to drop into the basket. Instead of using different clubs, in this game you use different discs - drivers, midranges and putters are all different shapes and provide different flight characteristics. 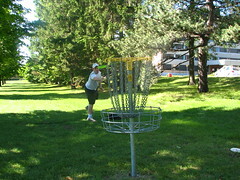 Ottawa, through the Ottawa Disc Golf Club has 3 public, permanent courses in the area, an 18 hole one at Jacques Cartier Parc (an NCC park), and two nine-hole courses, one in Kanata and short one in Orleans. There is a very challenging, 'summer only' 18 hole course at the Camp Fortune ski hill as well. All of these courses are par 3s. There are also some individuals in the Ottawa area that have private courses, none of which I've played yet though. Kevin and I have, due to our summer's off, played a lot of disc golf this year. In fact, as mentioned above we played 8 days straight this week. We played most days at Jacques Cartier, our regular course, though did play a round at Camp Fortune (tough) and one in Kanata. The days we played at JCP we typically played 36 holes, so we played a lot of golf. In total we probably played 12-14 rounds, pretty crazy. I equaled my best round, +3, at JCP twice this week, including today. My game has gotten much better this year, and I'm hoping to knock another stroke or two off of my game before the end of the season. With Kev and I both returning to work this week, it's likely that we'll only get a chance at a weekend round or two for the remainder of the year - but that will suit me just fine.